The Lamborghini Spire F VRT isn't just the most attractive and technologically advanced specialised tractor on the market, it's also the most powerful, the most productive and the best performing. Thanks to the VRT transmission, FARMotion engine, efficient hydraulic system with 100 l/min Load Sensing pump, optimum comfort of the new cabs and the new MaxCom armrest, it's undoubtedly the best in its class. Spire F VRT stands out not only for its exclusive, elegant design in keeping with the Lamborghini family feeling, but also for a cab that boasts unprecedented comfort. Attention to details and the use of technical features usually only found on models with far higher power levels are what separate the Spire tractors from their competitors: this refined note of elegance always makes the difference. The Spire VRT models produce a good feeling straight away, and their user-friendly nature makes everything more simple, even with the most complex functions. Apart from unrivalled operating comfort both in the field and on the road, the new VRT transmission also allows a top speed of 40km/h at low engine speeds, for limited consumption. To maximise productivity, automatic front wheel drive enabling and differential locking are standard features, and the Spire F VRT can even be managed without touching the accelerator, clutch, gears and brakes... using just the joystick! There's a dedicated potentiometer for selecting the engine operating mode, so as to optimise performance and consumption in every situation, at the same time improving safety during manoeuvres thanks to "PowerZero" and the HPB hydraulic parking brake (that comes as standard). The comfort of hydrostatic transmission, combined with the efficiency of the mechanical solution. Hydraulics at the top of the range for specialised tractors. The hydraulic system features a high performance Load Sensing pump with a capacity of 100 l/min, which can be delivered at engine speeds as low as 1,850 rpm, plus an additional independent pump with a capacity of 42 l/min dedicated to the power steering system. The new hydraulic system has been designed to handle up to 10 rear couplers with electro-hydraulic control, along with 8 belly couplers and another 3 high-capacity front couplers. In addition, thanks to the option that permits the user to regulate the hydraulic functions via the new joysticks, even the most complex hydraulically-operated equipment can be connected quickly and easily, guaranteeing maximum in productivity. Top of the range ergonomics and numerous configuration options. In addition to the elegant design and unparalleled levels of comfort, the new cabs offer a wide range of configurations and trims. The Spire F VRT is available with a flat platform. The new central console moves together with the steering column, ensuring the best possible posture for every driver. The InfoCentrePro has a new colour display that combines all the main machine functions, with Comfortip automatically managing the field-end operations. Upon request, the cabs can be supplied to comply with the strictest safety regulations for work with crop treatment products. And for even more impressive comfort and productivity, the tractors may be equipped with independent wheel front suspension and 4-wheel steering. Apart from the conventional swinging front axle, Spire F VRT models are also available with a new hydropneumatic, independent front suspension system with active control, enabling the front wheels to execute vertical oscillations independently of one another. A dedicated control unit adjusts the response for each individual wheel, resulting in a suspension system with extraordinarily effective dynamic behaviour that also ensures outstanding precision in mechanised canopy management when using equipment fastened firmly to the tractor body. The suspension units are also controlled electronically in order to reduce pitch and roll effects at higher speed, although this function may be disabled, if deemed necessary. In additional to all this, the machine may also be equipped with 4-wheel steering. 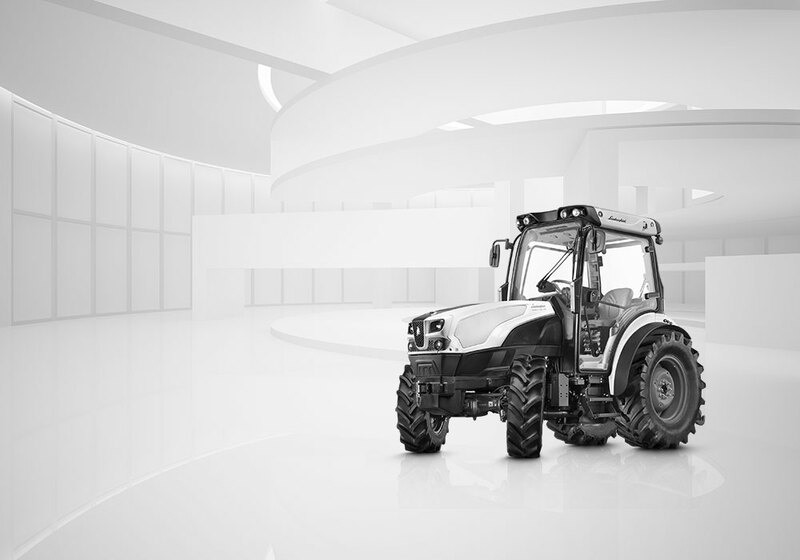 This allows the tractor to work in cramped conditions by offering significantly better manoeuvrability and a much tighter turning circle compared with a conventional machine, but with no penalty in terms of track and wheelbase. The new rear axle allows the rear wheels to steer up to an angle of 20°, while the position of the wheels is controlled by an electronic control unit offering the driver a choice of different operating modes. The anti-dive system prevents the front suspension from diving and causing the centre of gravity to shift, to make braking significantly safer. The anti-roll function automatically adjusts the damping action of the suspension in relation to steering angle and speed, for superior stability grip, especially when negotiating bends during use on the road. DTC stands for Differential Traction Control. This is an electronically controlled differential with an automatic, progressively engaged differential locking system. The front differential is capable of locking by up to 100% to prevent the front wheels from slipping and maintain constant traction in varying grip conditions. The DTC significantly improves performance on the road and in the field. A permanently active automatic self levelling system maximises comfort in all conditions, keeping the suspension pistons at mid extension by analysing ground speed, steering angle and signals received by the electronic control unit from the piston position and speed sensors. As speeds below 15 km/h, the electronic suspension control system creates a swing effect (similar to a rigid axle), allowing the arms an excursion of approximately 6°. This maximises grip in rough terrain conditions, and especially when driving on gradients or performing headland turns.